Add to paint to create rough surface texture. Spherical glass beads that can be added to any paints, mediums or gels to create a significantly rough surface texture. Interesting visual effects can be achieved by sprinkling these beads onto the surface of wet paint that has just been applied. 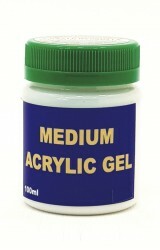 Add beads to paint, medium or gel and stir. Apply with a paint brush only. If you sprinkle these beads onto the surface of wet paint that has just been applied, the beads will stick when the paint is dry. After adding to paint these beads will tend to settle to the bottom so stirring before and during use will be required. In low and medium body paints this settling will be relatively fast but much slower in thicker gels. The beads do not go hard after settling so long-term storage of paint after adding the beads is possible provided they are stirred before use.